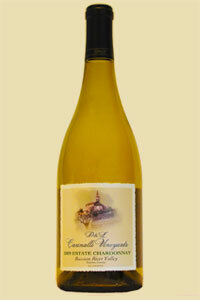 D & L Carinalli Vineyards offers Chardonnay wines which are fermented and aged in American and French Oak barrels. 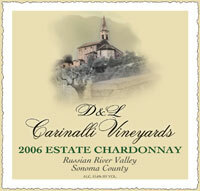 These wines embody the silky, yet rich flavors with hints of green apple and ripe pear. 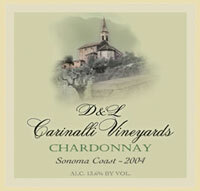 Although our vineyard started in 1996, the first year we sold Chardonnay wine under our own D & L Carinalli Vineyards label was in 2003. The 2003 and 2004 wines are designated as Sonoma Coast. The 2005 bottling saw a change of Appellation to Russian River Valley. Our 2006, 2007 and 2008 wines are Russian River Valley, Estate Wine. Our 2007 Chardonnay, Russian River Valley, Estate Wine, won a Double Gold at the 2009 SF Chronicle Wine Competition! Our 2010 Chardonnay, Russian River Valley, Estate Wine, won a Gold at the San Francisco International Wine Competition 2012. 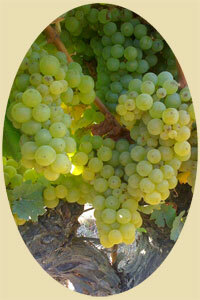 Our 2011 Chardonnay, Russian River Valley, Estate Wine, will be ready for sale in October 2012.